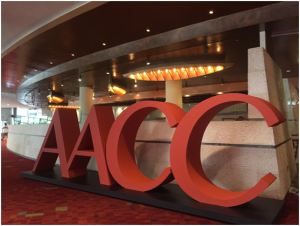 This is Health Gene Tech’s second appearance at AACC:AACC is the largest and most professional exhibition in clinical laboratory history. It brings together more than 700 exhibitors and 18’000 visitors from more than 100 countries around the world: chief laboratory physicians, business managers and executives, medical experts, product development experts, and other high profile executives. This is the best place to be and catch up with the hottest news in the clinical medicine world this year. 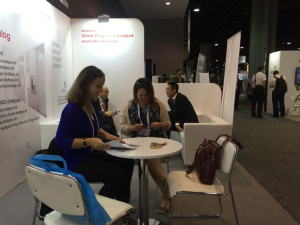 Health Gene Technologies on show exhibits included capillary electrophoresis analyzer-Applied Biosystems3500xl Dx DNA sequencer(sponsored byThermo Fisher Scientific Inc./Life Technologies)and three lines of reagent kits developed on the analyzer, ie. CE-IVD marked HPV 25X multiplex kit, ALDH2/ADH1B genotyping kit and CYP2C19 genotyping kit. Additionally, visitors could take a look at human identification kits and RUO reagents. 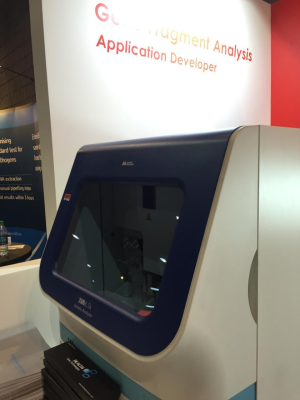 Health Gene Tech’s reagents are compatible with- ABI3500xlDxGenetic Analyzer.Asa co-marketing activity, Thermo Fisher Scientific Inc. (Life Technologies) supported Health Gene Tech with its ABI3500xl to be demonstrated on the HGT booth. This platform attracted a lot of attention fromrepresentatives ofworldwide laboratories and distributors. People showed great interest towardsthe CE-IVD marked and RUO diagnostic kits compatible with ABI3500xl. Health Gene Technologies founded in August 2011 is focused on gene analysis, molecular diagnostics product development, as well as the production and the sales of the products. HGT boasts 2,000 square meters of molecular diagnostics R&D laboratory and a 1,000 square metre GMP standard purification plant. It employs both domestic and foreign leading molecular diagnostics and production management personnel, led by the professional R&D team. Inspired by our motto "Health Technologies • Healthy Life" HGT commits to high standard AFA product development. The unique AFA technology is dedicated to independent R&D and production of nucleic acid molecule detection products. The products comply with leading international standards for human ID and paternity identification, infectious pathogen detection, individualized medication guide and provides the most superior molecular detection solutions.